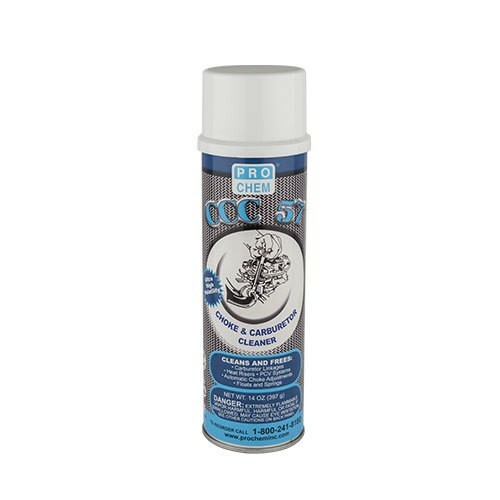 CCC 57 | Pro Chem, Inc.
CCC 57 cleans carburetors without disassembling. 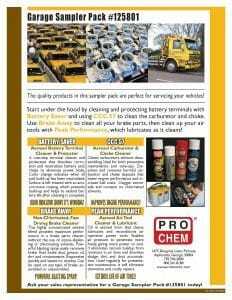 Ideal for both preventive maintenance and tune-ups. CCC 57 dissolves and removes harmful carburetor and choke deposits that lower engine performance and increase fuel costs. It cleans quickly and thoroughly without the time and labor involved in disassembling. Special, high quality oil ingredients coat abrasive particles released from the carburetor into the combustion chamber, reducing abrasive wear and increasing the life of pistons, rings and cylinder walls. Carburetor and Linkage: With ignition off and engine cool, remove air filter cleaner and spray entire exterior surface of carburetor, including linkage, springs and housing. After carburetor dries, start engine and spray product down the carburetor throat to remove the deposits from the lower throttle area. Automatic Chokes: With engine off, spray cleaner on both ends of the choke valve and corresponding linkages while opening and closing choke by hand. Manifold Heat Control: With engine cold, spray choke and carb cleaner on both ends of heat control valve shaft. Move counterweight up and down until valve moves freely. If necessary tap gently with a light hammer to loosen frozen heat control valve. PCV Valve: Disconnect crank case side of PCV valve. With engine running, spray product into open end of valve while working the plunger back of forth. IMPORTANT: If spilled or sprayed on painted surface, wipe off or wash off immediately.